The durian, if you are not acquainted with it, is a pungent fruit which on the outside looks like a cross between a giant kiwi fruit and a hedgehog. Inside the yellow flesh resembles a decayed kidney and smells like rotting rubbish. 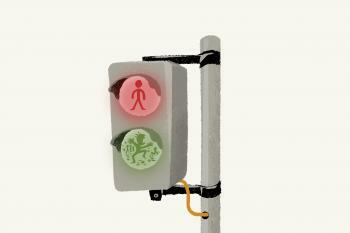 Its pong has got it banned from hotels, carry-on luggage and subway systems in Singapore; the sign proscribing it looks as if the city-state has outlawed spiky hand-grenades or a pernicious whoopee cushion. I moved to South-East Asia three months ago. In my second week, I went with two new Singaporean friends to Geylang, the red-light district, where we sat on rickety plastic chairs at a roadside stall, scooping out creamy durian flesh (which tastes like a combination of almonds, brandy and sour buttermilk) while wearing plastic gloves to stop ourselves stinking of the fruit. A few weeks later we ditched dinner and went straight to another stall instead. An oncologist friend of mine, knowing how much I like the stuff, now invites me over to eat the durians given to him by grateful patients. I’m not the only Westerner to have loved the “king of fruits”, as South-East Asians refer to it. 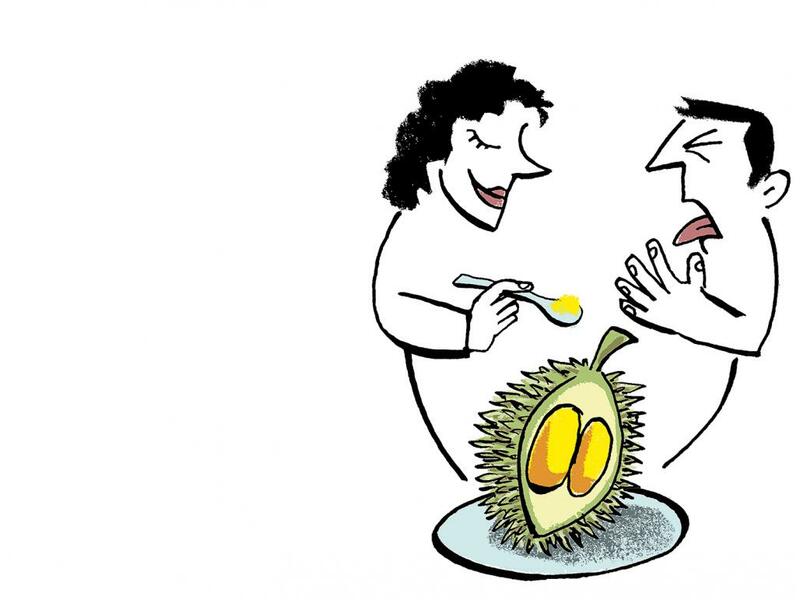 Alfred Russel Wallace, a British explorer, cooed that “to eat durians is a new sensation, worth a voyage to the East to experience.” But it is still rare enough for my Singaporean friends to find my obsession hilarious. Most of them are used to foreigners telling them they can’t stomach the smell of blue-cheese-meets-mouldy-old-socks, let alone eat the bittersweet insides. “An ang mo [white person] who likes durian? You must have a bit of Asian blood in you,” laughed one. Strangers are no less amused: on one of my durian forays a man laughed and gave me the thumbs up as I happily sucked the yellow flesh off the pips. Another took my picture. But what is rarer is that I am a 20-something who enjoys durian. With a few exceptions, everyone with whom I have eaten durian has been older than me – and no one younger than me has enjoyed it as much. My two original durian friends are in their 30s and 40s. The oncologist is in his 50s, and his teenage sons dislike the fruit so much that at a recent dinner we had to eat it in a separate room. Nearly all the young Singaporeans I’ve met are puzzled by my love of the fruit, with many expressing disgust or indifference. Most durian sellers insist that Singaporeans of all ages enjoy eating durian, and emphasise that it is just a divisive kind of fruit (“you either love it or you hate it”). But when pressed, several admit that their most ardent customers are middle-aged and above. Few teenagers can be seen at durian stalls on a weekend. Even at extremely popular venues, such as the Ah Seng Durian stall in Holland Village, where all durians have to be pre-ordered, most of those under the age of 25 are with their parents. The younger generation are “less exposed to it”, says Audrey, who was queuing up to collect her reserved durians on a recent Saturday with her two daughters. They like the fruit because she and her husband gave them “no choice”. But her nephew and nieces are less keen. Elsewhere in the city another mother talks about how her children, born after 1980, are less likely to enjoy the fruit; they have become Westernised, she explains, plumping for fast-food chains and imported fruits like strawberries rather than durians. Other millennials are put off by the increasingly high prices (the most popular kind of durian, Mao Shan Wang, can cost up to S$50 apiece), or by the high levels of sugar in the fruit. Celine, a 20-year-old arts management graduate, describes how her friends prefer to go to bars or “supper places” which are cheap. “No one goes out to eat fruit,” she says. Although there’s a kind of charm to sitting on a plastic seat next to a huge bin for durian husks, most of the durian stalls are less snazzy than other eateries. 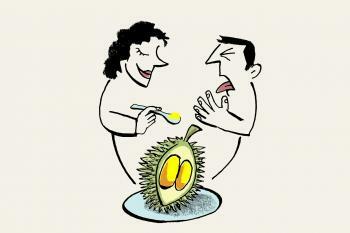 Many durian sellers are trying to change this. Established stalls, such as Ah Seng or Combat Durian – which, like New York diners, are plastered with photos of celebrity customers – rely heavily on social media, posting pictures of glistening yellow fruit on Instagram and Facebook in order to create a buzz. The Durian Story, a sleek modern shop, opened last year in north-east Singapore. It has a jolly website and offers delivery across the city. Others are going even further: in October the Mao Shan Wang Café opened in Chinatown, serving durian-flavoured pizza, strudel and ice-cream.